Last night the rumour mill reached fever pitch as Non Disclosure Agreements were stretched to their very limits. And this morning the Twitterweb was a-buzz with the news that Abbott's Freestyle Libre flash glucose monitor is to become available on the NHS from 1st November*. JDRF issued this nifty press release and everyone's second-favourite cat-loving pyjama-wearing T1 ex-schoolteacher and all-round good egg, Adrian Long, was even glimpsed on Sky News in the early morning undertaking some top Libre punditry and sharing his love of 'Libs'. * subject to local healthcare economic approval, CCG friendliness, moon in jupiter, blah blah blah. Of course, no sooner had the long-awaited announcement been made than people began to get a bit sniffy about it, or unbelievably optimistic - depending on their frame of mind. Either Libres were about to be handed out to everyone immediately, whether they wanted them or not; or it was going to be a postcode lottery / the end of CGM funding / a complete disaster. The official announcement from Abbott covers the whole of the UK, including Scotland, Wales and Northern Ireland. Freestyle Libre will be on the 'drug tariff'. Which means that it will be able to be prescribed, and reimbursed by the NHS. BUT (and depending on your point of view this might be a small niggle, or a deal breaker), this is subject to local health economy approval. I think I probably come down more on the side of 'wildly optimistic' about the announcement. But the 'local health economy' / local clinical commissioning group (CCG) approval thing is a bit of a worry. Even the JDRF announcement is rather cautious, stressing how important it is that the technology actually does end up reaching people. There may still be some work to do in your area to encourage the bean counters to play fair. The cost to the NHS of one Libre sensor is going to be £35. For people using intensive insulin therapy who might be using 8 or more finger stick test strips a day, the costs more or less balance out. Assuming an average-ish strip cost to the NHS of £14.50/pot it costs the NHS about £2.32 a day for 8 strips, versus £2.50/day for Libre sensors lasting 14 days where you can be checking 15, 20, 30 times a day or more. I am reminded of the real-world data that Abbott shared recently. In general, across all their users, the more people used Libre, the better their results. Fewer hypos, fewer highs, more time in range and a lower predicted HbA1c. Even if you are not prepared to take on the heaving behemoth that is your local CCG and try to turn them around to the idea, I can certainly imagine myself having an interesting conversation with my GP (who, of course, runs their own business) about exchanging my strips for sensors for all the added benefits that gives me. It may be that as part of that negotiation I suggest paying for my own strips for DVLA and other occasional requirements. The cost analysis undertaken by NICE for T1 demonstrates that 8-10 strips a day can be cost effective (more BG information is associated with better BG outcomes and reduced complication risk). There may be niggling details and rules about 'local formulary', but it's certainly a conversation I'd be interested in having with my GP if the local CCG drag their heels (as they have been known to do in my area). Getting your GP and/or hospital clinic on-side and banging the table for you is a good plan too. Speak to them and get them to apply pressure to the CCG to ensure readers and sensors are listed in the local formulary (which is located at Hogwarts just down the corridor from potions and defense against the dark arts). But what about 'proper' CGM? Some people have worried that all these funds getting diverted to Libre will spell the end of CGM funding. Personally I don't see that happening. CGM is currently only weakly recommended in national guidance for people who have significant problems with recurrent hypoglycaemia and have lost all or almost all of their hypo warning signs. 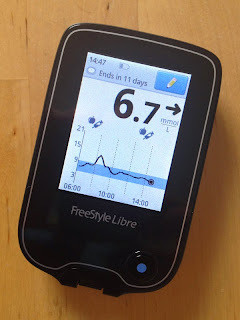 The submissions to the NHS for approval were very clear that while Libre can really help some people reduce their exposure to hypoglycaemia with extra information, they are not a substitute for CGM alarms/sensor augmented pump for those with no awareness. Diabetes UK have put together a position statement on Flash Glucose monitoring which I was pleased to be involved in, and which I think clarifies many of the issues about the Freestyle Libre. What it is good for and who can benefit from it. Thankfully it involves people with Type 1 and Type 2 diabetes - and actually I think should be applied to anyone with any of the many types of diabetes who are intensively using insulin. The recommendations on page 4 are very interesting. Of course some people have been able to carefully negotiate the fiery hoops to secure full or partial NHS funding for CGM in their own particular case. I'm not sure I see the availability of Libre as affecting the clinical reasons which led to their funding being granted - unless they wanted to swap of course! Freestyle Libre is not a CGM, and does not issue alarms. If those alerts are important to you, then CGM is the better option. But for others the lack of 'alarm fatigue' is a positive benefit of Libre. I am really encouraged by this announcement. It's been a long time coming and a lot of work has been done behind the scenes to get to this point. Huge thanks to Lesley and Melissa at INPUT, the team at JDRF and Diabetes UK, and not forgetting Dr Partha Kar in getting us this far. I am absolutely convinced that Freestyle Libre has a huge potential to help thousands of people who are quietly struggling with their diabetes management. Not in extreme enough need with frequent A&E visits to attract CGM funding, but just keeping going not knowing what they don't know about their BG fluctuations. I really hope the technology can be made available so that those quiet strugglers can go from doing OK to doing really well. Can reduce their long-term complication risk and improve their quality of life. Thanks Mike - that's great news, understood there might be limitations. Love that last paragraph Mike...really says it all! Just a note on your point about CGM and hypo unawareness. One of the biggest things left out of all these conversations is the flow of information when not scanning — particularly while sleeping, which can help improve HbA1C with less time spent in hyperglycemia, not just preventing hypoglycemia. While hypos are an immediate concern, it's the HbA1C reduction that will ultimately save money for the NHS. Completely agree with your point about alarm fatigue meaning CGM isn't for everyone, but I can see why this is so worrying for people who would prefer CGM. Besides the fears of losing access to CGM, it's about ensuring people with diabetes can make the best informed choice — and pick between either. I think this is why so many people feel that Flash is a half step. Obviously the data is only useful when people action it — but there is a definite advantage to CGM over Flash, and people need to know about both options, and weigh the pros and cons that lead to the best overall quality of life. Hi, does anyone know whether the DVLA will accept Libre readings rather than a test using a strip? As far as I am aware, as it stands the DVLA guidance specifies *blood* glucose monitoring, so Libre results (or any CGM) do not apply. Re libre not having alarms, thought I'd just mention that if you buy a Blucon Nightrider from Ambrosia Systems for an one-off cost of just over £100, pop it on top of the sensor, it'll bluetooth readings every 5 mins to xDrip+, so you can calibrate and get alerts. Blucon from Ambrosia seems to get mixed reviews from what I've seen, some people are enthusiastic, others seem to have had pretty poor dealings with the company/product. It's also important to realise that Ambrosia are using their own algorithms to interpret data from the sensor, so you won't necessarily get the same readings/performance that you'd get from the Libre reader and Abbott's (Android) smartphone app. I agree that Ambrosia's inhouse app "LinkBluCon" is pretty poor, but now that xDrip+ has recently been tweaked to accept data from BluCon, it's a different story. I'm not using the inhouse app at all. I'm using xDrip+. I'm not sufficiently aware of the technology behind it all, but, as far as I'm aware, the blucon itself is merely transmittig the data, not interpreting it, which is then done by xDrip+. Only been using it for 2 weeks, so early days, but have found it very good, especially being able to calibrate, which simply cannot be done with libre reader. Plus I get alerts. For a one off cost of just over £100 to turn libre into cgm ain't bad in my view. Thanks Anon, really interesting to hear your experiences.